The Studebaker Golden Hawk is a beautiful car with its exceptionally beautiful radiator grille and particularly beautiful lines of the front and the sturdy looking bonnet. Large chrome bumpers and many chrome mouldings to accentuate the body. A particularly nice flash in the wings of the rear fenders makes it a real American car. Meccano Liverpool did a nice Job to reproduce this beautiful American car. The assembly drawing dates 24.5.57. I presume that reproduction from model 1957 may be assumed. 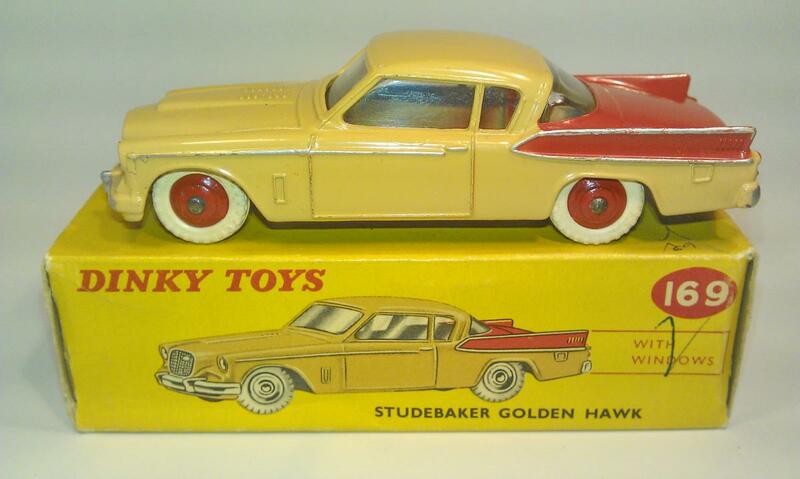 With this Studebaker Golden Hawk I now have 5 Studebakers which I will also show in my contribution. My Studebaker Golden Hawk with red ridged hubs and white treaded tyres. Note the “spun” concave hubs depicted on the box. 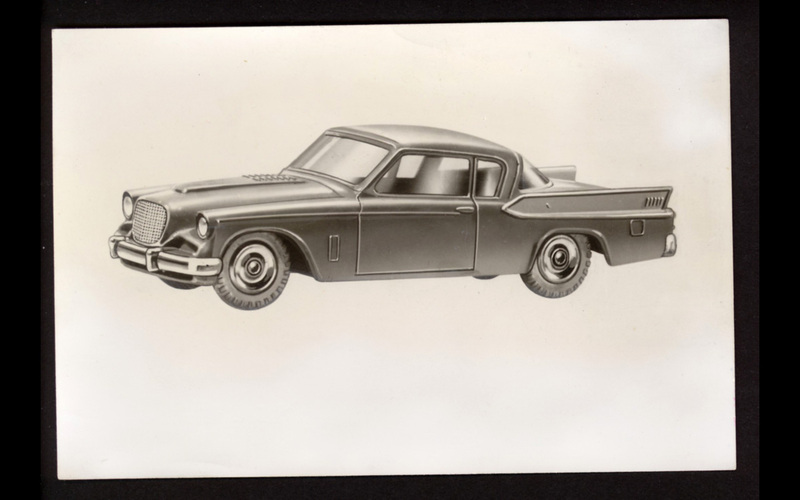 The Studebaker Golden Hawk was introduced in MM November 1958 together with the 167 A.C. Aceca Coupe. Introduction Studebaker Golden Hawk in MM November 1958. Note the concave hubs. Meccano Liverpool was apparently quite fond of the Studebaker brand, because a month earlier the 179 Studebaker President Saloon was already introduced in MM October 1958, see below. Introduction Studebaker President in MM October 1958. My 179 Studebaker President with cream ridged hubs. The 1950s were the heyday of the American automotive industry and also the glory days of Meccano Liverpool. After a range of military models in 1957, in 1958 and 1959 various British and American car models were produced. I limit myself here to the American classic car models. 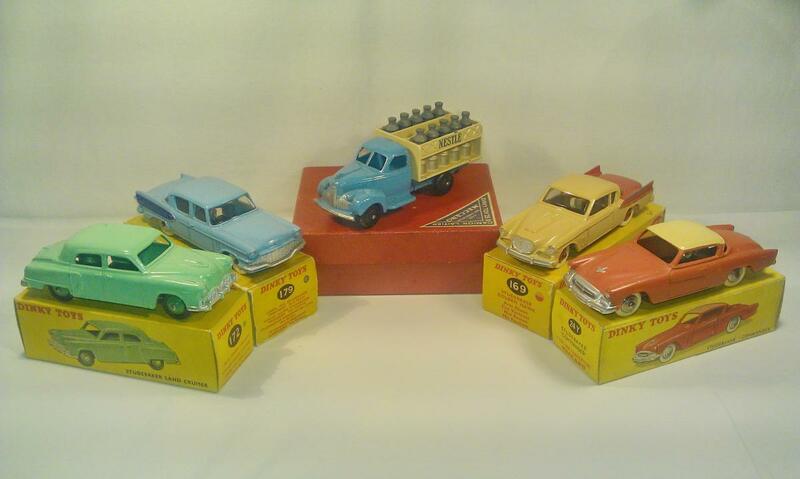 From May 1958 to March 1959, Meccano Liverpool produced 8 new classic American car models. In 1958: May 173 Nash Rambler; August 175 Hudson Hornet; September 180 Packard Clipper; October 179 Studebaker President; November 169 Studebaker Golden Hawk; December 192 The Soto Fireflite. In 1959 January 178 Plymouth Plaza; March 191 Dodge Royal Sedan. 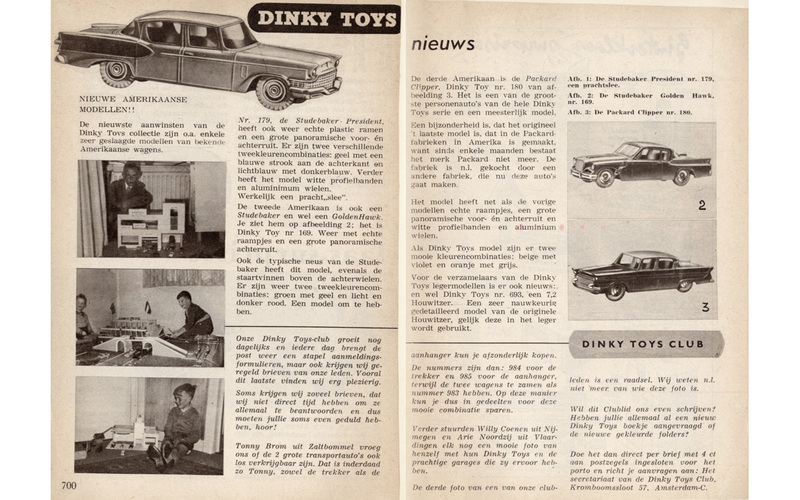 I show here the Dutch leaflet of February 1959 with British and American car models that were produced in 1958 and 1959. It shows 6 UK and 6 American car models, of which 2 Studebakers, the 169 Studebaker Golden Hawk and the 179 Studebaker President. In the 1959 catalogue you see clearly the transition period from ridged to concave hubs. Some have ridged hubs and some have concave hubs. The concave hubs were first fitted from December 1958 onwards but apparently the stock of ridged hubs had to be first drawn up. Dutch leaflet February 1959 with 169 Studebaker Golden Hawk and 179 Studebaker President. In the leaflet you clearly see the transition period from ridged to concave hubs. Some have ridged and some have concave hubs. Concave hubs were fitted from December 1958 onwards. Dutch leaflet February 1959 with the Studebaker Golden Hawk depicted with spun hubs. UK catalogue May 1959 with 169 Studebaker Golden Hawk. Some models with ridged and some with concave hubs. UK catalogue May 1959 with the Golden Hawk depicted with red ridged hubs. The same as mine. My 169 with red ridged hubs: Note the excellent contours of the doors, door handles, ventilation flap, fuel cap and chrome mouldings. My 169 with shiny baseplate. My 5 Studebakers: 3x UK - 169 Golden Hawk - 172 Land Cruiser - 179 President and 2x French: 24y Commander - 25o Camion Latier. Studebaker Golden Hawk 1957. A beautiful very impressive car. Studebaker was an American automobile manufacturer based in South Bend Indiana. Founded in 1852 and incorporated in 1868 as the Studebaker Brothers Manufacturing Company, the firm was originally a producer of wagons for farmers, miners, and the military. Studebaker entered the automotive business in 1902 with electric vehicles and in 1904 with gasoline vehicles, all sold under the name "Studebaker Automobile Company". Until 1911, its automotive division operated in partnership with the Garford Company of Elyria Ohio, and after 1909 with the E-M-F Company. The first gasoline automobiles to be fully manufactured by Studebaker were marketed in August 1912. Over the next 50 years, the company established a reputation for good quality and reliability. After years of financial problems, the company merged in 1954 with luxury carmaker Packard to form the Studebaker-Packard Corporation. However, Studebaker's financial problems were worse than the Packard executives had thought. The Packard marque was phased out, and the company returned to the Studebaker Corporation name in 1962. The South Bend plant ceased production on December 20, 1963, and the last Studebaker automobile rolled off the Hamilton Ontario, Canada, assembly line on March 17, 1966. The Studebaker National Museum is a museum in South Bend Indiana, United States that displays a variety of automobiles, wagons, carriages, and military vehicles related to the Studebaker Corporation and other aspects of American history. Studebaker Golden Hawk 1958 brochure. April 1958: windows first fitted to vehicles. August 1960: first “Directional Control” steering fitted to 195 Jaguar 3.4. 1961: change from plain to treaded tyres on cars. 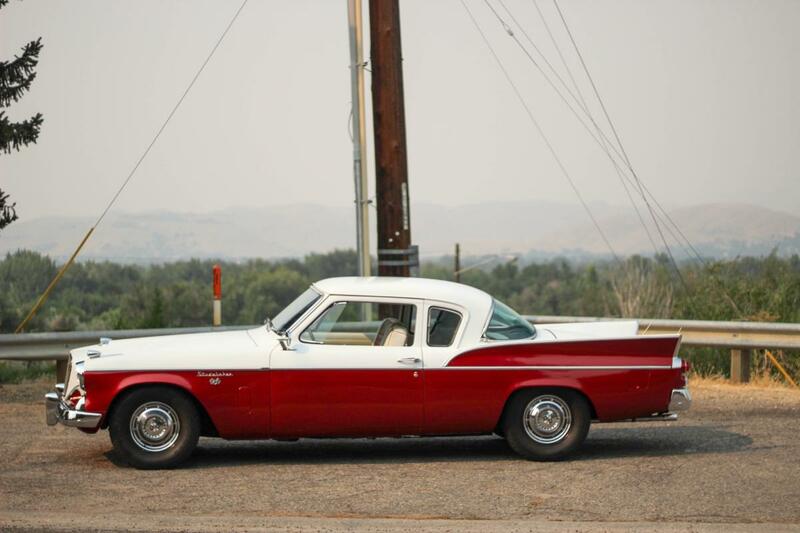 A nice Studebaker account, Jan, and a fine example you have indeed! Exactly the same model in the same mint/boxed condition was one of the first Dinky Toys I bought when I resumed collecting them, back in 1979. I wasn't very experienced then and I had the small, youthfully immature collection on permanent display in a cabinet in the living room. I wasn't aware yet of the vulnerability of some of the red paints Meccano used, turning into pinkish red when exposed to the daylight too much. Exactly this one turned out to be very prone to fading to the red wheels, tail and back, as I discovered after a few years. Also the absolutely snow white tyres lost their brightness after some time. I was upset and regretted this very much and decided to take my strict measures as preservation is concerned. I immediately built the big cabinets complex which is still in use now, in a special room which is always in darkness and only very incidentally exposed to (UV filtered) daylight when necessary, for viewing etc. So, please, be careful with this model in this respect! 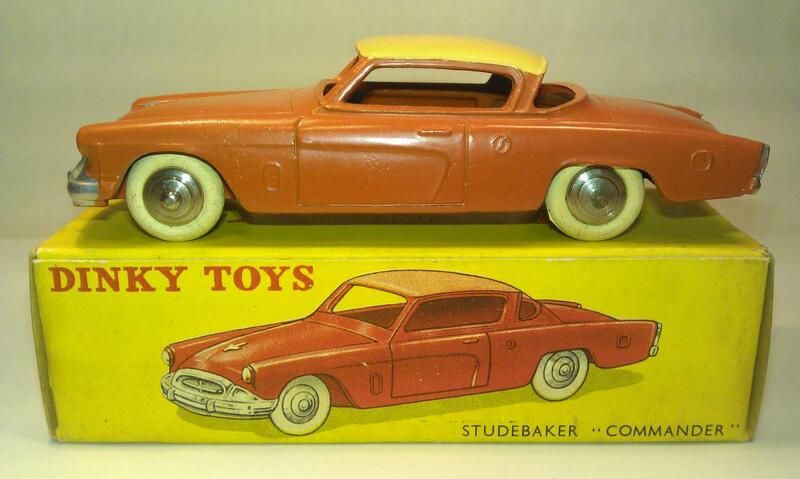 Jan—-A very nice writeup on the well-known Studebaker Golden Hawk, plus the several other Studebaker models. I was always a fan of their cars, and really liked the various Hawks, but I was also somewhat puzzled why Meccano made so many Studebaker models over the years. Compared to General Motors and Ford, they were a much smaller company with far less sales and success, and shortly after these last models were introduced, they went out of business. Another company Meccano modeled frequently in the 1950’s was Nash and Hudson....another much smaller, I’ll-fated company. I often wonder of H. Hudson Dobson was instrumental in promoting them? 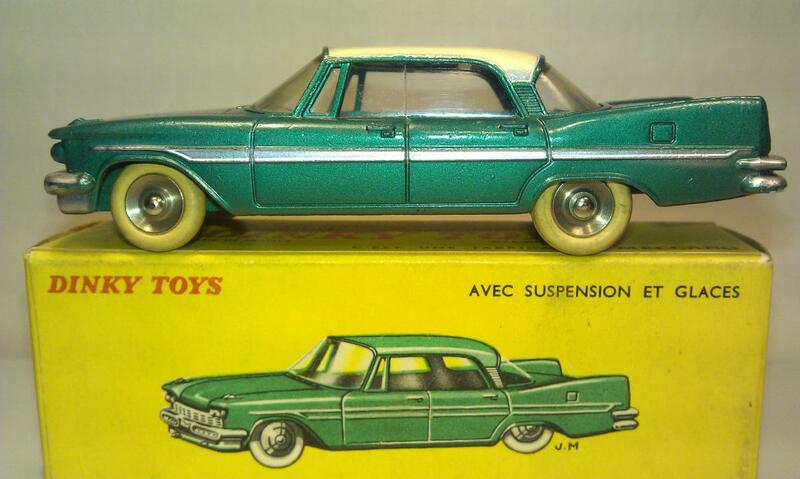 One other comment; I did not notice it before, but having looked at your many photos of the real Golden Hawk, I noticed one discrepancy: the Dinky Toys Model shows a vertical bar on each side window, like that shown for the less expensive Silver Hawk, but the Golden Hawk did not have that bar. Jan, amazing how lucky man you are to get these wonderful photos of the Dutch distributor Hausemann & Hötte. Every collector dreams to have such valuable and nostalgic original photos of such magazines. Its very sad that such an important distributor disappeared from the Dutch game and toy market. But you got very important and valuable documentation out of the glorious time of these company. And I have to say: it has become on the right place. Terry, very sharp your observation of the missing doorstyle of the real Golden Hawk. Remarkable that the window of the 169 model is not extended over the entire side, as is the case with his French brother Studebaker Commander, who incidentally has no windows. 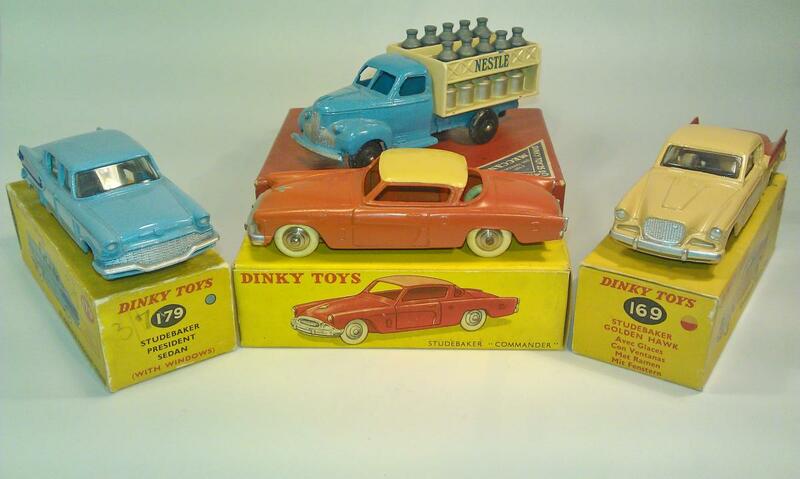 Dinky Toys UK did have the technical possibilities to do it, as with the 147 Cadillac 62 and the French Factory also did with the 545 De Soto Diplomat. 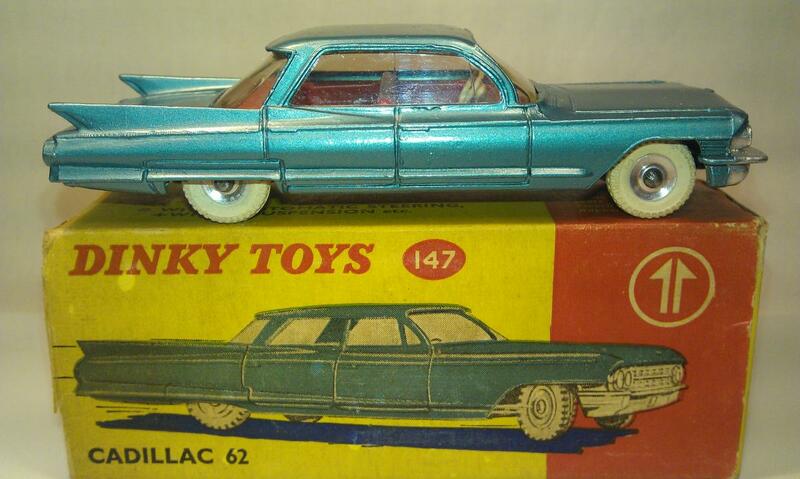 However, the Dinky Toys 169 model has not received the wrong type of designation if you look further at the model. The 169 Golden Hawk also has the sharp pointed beginning of the side wing of the real Golden Hawk, while the Silver Hawk is more rounded and the decorative strip of the 169 Golden Hawk does not run the entire length, which is the case with the real Silver Hawk. Outside of that, the door style of the Silver Hawk is straight and the window style of the real Golden Hawk is slanted, similar to the door style of model 169. See the pictures of a real Studebaker Silver Hawk and Golden Hawk 1957 below compared to Dinky Toys model 169 Studebaker Golden Hawk below. I also added pictures of the 24y Studebaker Commander, 147 Cadillac 62 and 545 De Soto Diplomat to compare the door and window styles to the 169 Studebaker Golden Hawk. Only, Terry indeed, the door style should not be in the 169 Studebaker Golden Hawk. You should actually see it as a window style. In my opinion is that the only thing that does not fit the model. It is very funny to discover such things. That makes the forum very valuable and instructive. I enjoy that members research such findings and contribute that in the forum. Kind regards, Jan Oldenhuis 20 January 2019. It must have been a modeller’s dilemma as to whether to include that glazing bar making it look Silver Hawkish but overall it is nicer than the Commander which looks like something is missing! You show how models with windows can tackle the issue, but even Corgi on their glazed version put in the glazing bar. Even the quite nice Matchbox Dinky DY-26 has a silver painted bar. Solido did both Golden and Silver Hawks, basically one without and one with the bar, the former looking better with a full open side. On the real Golden Hawk, when the windows are rolled up, there would have been a thin, chrome strip, that acted as a seal between the front and rear window....it wasn’t one large window. So I understand that is difficult to model. 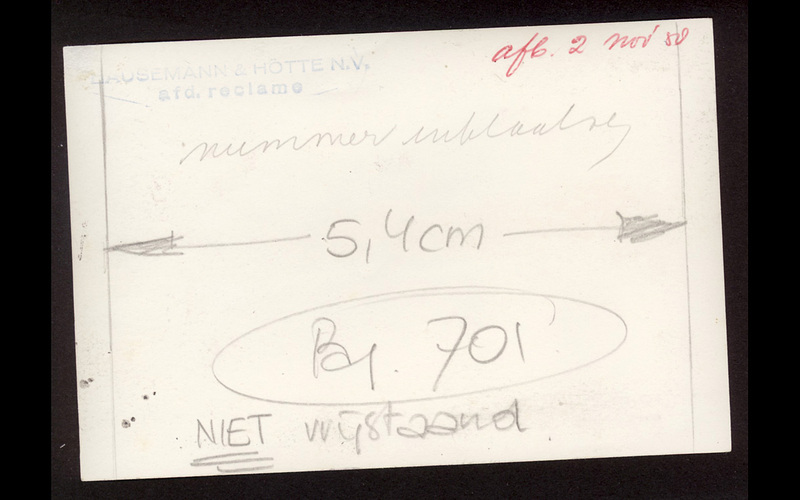 Perhaps that could have chosen to use a very slender strip, such as used on the French Dinky Toy Simca Versailles on the front vent window. I just happened to look at mine the other day, and I was astonished how nice that one looks, and so very thin! There is little to choose in size between the Versailles and Studebaker bars, the window being bigger on the former making it appear slender and not having the detail which they managed on the Studebaker bar. Perhaps just a dab of silver paint while painting the grille and bumpers should have been specified! To visualize the difference between the 169 Studebaker Golden Hawk and 24z Simca Versailles, I show the close up pictures of both.